Khuzestan is the only predominantly Arab province of Iran, and also happens to be one of the richest oil producing provinces in the entire country. It has been alleged that control over it's oilfields and waterways were some of the reasons that Saddam Hussein invaded Iran in 1980. Additionally, many Khuzestani Arabs argue that the central Iranian government currently systematically discriminates against the Arabs in Khuzestan by giving them less of the oil revenues generated in their province than the Persian citizens of the same province. As a result, Arab separatist groups have emerged in Khuzestan and have been known to carry-out attacks against Iranian government buildings in the area. Conflict in the province continues to this day. For over 1,000 years, dating back to Biblical times, no political boundary existed between Mesopotamia (Iraq) and the Iranian plateau. Instead, areas in what is now known as Iran were ruled by dynasties centered in Iraq (1). However, Arabs made their first push into the area now known as Khuzestan in 639 AD, when Abu Musa Al-Ash’ari drove the Persian army out of Ahvaz and Susa (2). In 1441, Muhammad ibn Falah, an Iraqi theologian who believed that he was the earthly representative of Imam Ali and the Mahdi, led his Arab army to victory over the Persians, freeing Khuzestan in its entirety from Persian control. As a result of the military victory, Arabs from Mesopotamia immigrated eastward to Khuzestan. As the Arab population in the region increased, Khuzestan became known as Arabistan (3). In 1837, the territory came back under Persian control when the city of Mohammarah fell to the Shah of Persia. Sheikh Khaz’al led a secessionist movement, financed by the British, beginning in 1897. This movement was largely successful, as Khuzestan became a de-facto autonomous region of great strategic importance due to the 1908 discovery of oil (4). Khuzestan’s autonomy was short lived, however. Sheikh Khaz’al was arrested soon after Reza Shah became the Shah of Iran in 1925, and Khuzestan came back under Iranian control. Reza Shah then embarked upon a campaign to forcibly settle Khuzestan with non-Arabs, in hopes to dilute Arab culture and quell unrest in the province. His plan backfired, however, as Arab tribal leaders resisted the Shah’s call to destroy the Arab culture and way of life (5). Khuzestani Arabs continue to resist the dilution of Arab culture to this day, as it has been a policy of successive Iranian governments to bring this strategic region fully under Persian control. Today, according to the CIA World Factbook, 3% of Iran's population is Arab, while 51% is Persian. However, as previously stated, the province of Khuzestan is the only province in Iran that has a majority Arab population. Human Rights Watch estimates that the Arab population in Khuzestan is as high as 70%. Despite constituting a majority of the population in Khuzestan, Arabs are continually discriminated against in a variety of ways. Principle among these grievances is the allegation that the central Persian government does not fairly share its oil revenue with the Arab population in Khuzestan. To read a detailed account of the grievences of Khuzestan's Arab population, please click here. The oil industry has been the main industry in Iran since the 1920s, after the 1908 discovery of oil in the Khuzestan province. By the late 1970s, Iran had become the world's fourth largest producer of crude oil and the second largest exporter of petroleum. The war with Iraq cut Iran's production in the 1980s, although Iranian oil reserves remained the fourth largest in the world. As of 2002, Iran held 90 billion barrels of proven oil reserves, or roughly 9% of the world's total (6). Approximately 90% of Iran's crude oil reserves are located in giant onshore fields in the Khuzestan region (7). Iran's economy relies heavily on oil export revenues. They are said to account for 80-90% of the country’s total export earnings and 40-50% of the total government budget (8). Despite the enormous earnings of Khuzestan’s oil industry, Arabs in the province have been consistently refused the allocation just 1.5 per cent of oil revenues, as demanded by the province’s representatives in the Majlis (parliament) (9). This has, as of recent, been a source of conflict between the Arabs of Khuzestan and the central Iranian government. On September 22, 1980, Iraqi soldiers stormed across the Iranian border beginning the Iran-Iraq war. Among the principle objectives were to capture the Khuzestan Province, which Saddam claimed belonged to Iraq (11), and take the oil refinery in Abadan, Khuzestan’s capital city, where they hoped that the local Arab population would rise up against the Iranian government and capture the province’s resources (12). This proved to be a grave miscalculation on the part of Saddam Hussein, as the Arabs of Khuzestan, filled with Shia and nationalistic fervor, fought effectively against the invading Iraqi army. The Iran-Iraq went on to last until 1988. It is estimated that there were over 500,000 war-related casualties in the war (13). It has been alleged by many Khuzestani Arabs, as well as a variety of international organizations, that the central Persian government systematically discriminates against the Arabs of Khuzestan in a variety of ways. For example, one such organization, Amnesty International, argues that Iranian authorities routinely deny basic amenities to Iran’s ethnic and religious minorities, such as the Khuzestani Arabs, and in some cases seize their land. Amnesty International goes on to argue that “the marginalization of these communities has fed civil unrest, leading to clashes with security forces, escalating violence and an atmosphere of anger and mistrust” (14). Such mistrust exploded in April 2005 when riots broke out in several Khuzestani cities after a controversial letter, attributed to Iranian Vice President Muhammad Ali Abtahi, was made public. This letter, which was denounced by Abtahi as a forgery, called for expelling Arabs from Khuzestan and replacing them with Persians in order to dilute the Arab majority in the region. At least 20 people were killed, and 300 protesters arrested in the riots (15). The riots seem to represent a turning point in Khuzestani Arab/Iranian relations as ten bombs have rocked the region in subsequent months. Just two months after the April riots, on June 12, 2005, four bombs exploded in the Khuzestani capital city of Ahwaz, killing eight people and wounding 70 more. Later the same day, another bomb exploded in Tehran, killing two people. Three other bombs were diffused. All of the bombs had been targeting Iranian government buildings (16). Three Arab separatist groups claimed responsibility for the attacks; The “Arab Martyrs of Khuzestan,” the “Arab People’s Democratic Front,” and the “Armed Renaissance Group of Ahvaz” (17). By October 16, two more bombs would once again detonate in the city of Ahvaz (18), this time leaving five people dead (19). Though a group calling itself “Usamah Mahdi” claimed responsibility for the attacks, the Iranian government blamed the British (20). On January 24, 2006, another two bombs exploded in Ahvaz, this time killing nine people and injuring 45 (21). Another bomb exploded in Ahvaz on January 28, 2006, though nobody was injured. The Iranian government went on to once again blame the British for these terrorist attacks. No group claimed responsibility (22). The Arabs have been fighting against the Persians in the area now known as Khuzestan, Iran, since 639, when Abu Musa Al-Ash’ari drove the Persian army out of Ahvaz and Susa (23). The reasons for the continued fighting have been consistant: for control over a strategically important area of land. Since 1908, the importance of Khuzestan has grown significantly due to the discovery of its enormous oil fields, whereas in the past, access to water was of primary importance. Thus, it would be accurate to say that the duration of the conflict has been within the broad spectrum of one-hundred (100) to one-thousand (1,000) years. Map of Iran. Khuzestan is highlighted in bright green (24). The province of Khuzestan can be divided into two regions; a generally flat plains region in the southwest of the province, and a region dominated by the Zagros Mountains in the east. In the mountainous regions of the province, a moderate summer and cold winter are experienced. In plains region of the southwest, a variable climate ranging from semi-desert to coastal desert dominates. Thus, this region experiences long, warm summers and short, moderate winters (25). According to a 1996 census, the province has an estimated population of 3.7 million people, and the province covered 63,213 km2 (24,407 miles2) (26). NASA photograph of Khuzestan province (27). Since there are two types of conflict over the Khuzestan Province historically, there are also two “Act” and “Harm” sites. When Saddam Hussein attacked Khuzestan in 1980 to start the Iran-Iraq war, the “Act” site would be Iraq, since his forces began there and attacked Khuzestan. The “Harm” site would, of course, be Khuzestan, which is said to have suffered the heaviest damage of any Iranian provinces. The other conflict, the Arab secessionist movement from Iran, has caused far less damage than the Iran-Iraq war. The “Act” site would Khuzestan, since the terrorist groups all originate from the province. The “Harm” site would also be Khuzestan, since the overwhelming majority of the attacks have targeted Iranian government buildings in the Khuzestan Province. The fatality level of dispute should be “1(7) = 1,000,000,” since combining the 500,000 people who died in the Iran-Iraq war and those who died in the terrorist attacks in 2005/2006 is well over 100,000. The Khuzestan conflict is a direct conflict over the need to retain an area rich in oil. 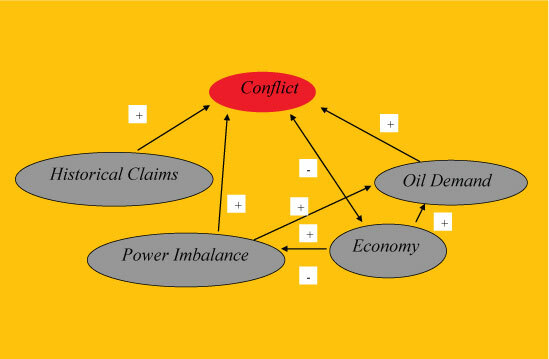 The following causal loop diagram helps visualize the complexities of the conflict. As one can see, many of the variables are mutually reinforced. For example, a poorly functioning economy can lead to a power imbalance which can then lead to conflict (as was the case in both the Iran-Iraq war, and as well as the Khuzestan Arabs in relation to the Persian Iranians). Additionally, historical claims can be a sole reason for conflict (again, as can be seen in the Iran-Iraq war). Furthermore, a power imbalance can lead to an increase in oil demand, which can then cause conflict (as seen in the Iran-Iraq war). The Level of Strategic Interest is Regional since Iraq has invaded Iran for access to Khuzestani oil, and now separatist groups are attacking the Iranian government and seeking independence because they feel, as Arabs, that they have been discriminated against because of their race, in terms of access to proceeds of Khuzestan’s oil sales. 2005 and early 2006 have seen a dramatic increase in Arab sucessionist activity in Iran. Between June 2005 and January 2006, at least thirteen bombs planted by Arab groups exploded or were diffused by Iranian authorities. All of the bombs targeted government buildings. Increased tensions between Khuzestani Arabs and the central Iranian government could, in fact, lead to a disruption in oil production, thereby harming Iran's economy and driving up the price of oil on the international market. Such an event could have a devestating effect on regional and world economies. 1) Latviaoil: Discusses the discrimination of ethnic Russians in Latvia, and Russia's refusal to sell oil to Latvia as a result. 2) Biafra: A case study analyzing ethnic Biafrans seeking independence from Nigeria, but the central government refusing to let them do so due to oil fields in the Biafran ruled south-eastern Nigeria. 3) Jordan: Analyzes the conflict between Jordan and Israel over access to the Jordan River. 4) Cedars: Examines the conflict between Canaanites, Aegeans, Armenians, and Phoenicians over Cedar trees in ancient Lebanon. 5) Hormuz: Analyzes the potential for conflict over the Strait of Hormuz between Iran, Oman, and the United Arab Emirates. (1) Lawrence G. Potter. The Evolution of the Iran-Iraq Boundary. Page 3. (2) Robert G. Hoyland. Seeing Islam as Others Saw It: A Survey and Evaluation of Christian, Jewish, and Zoroastrian Writings on Early Islam. Princeton, New Jersey: Darwin Press, 1997. Page 184. (3) “Ethnic Politics of Khuzestan.” Wikipedia website. 22 January 2006. http://en.wikipedia.org/wiki/Ethnic_conflict_in_Khuzestan. (4) Michael Rubin. The Jerusalem Center for Public Affairs. “Domestic Threats to Iranian Stability: Khuzestan and Baluchestan.” 23 November 2005. RegimechangeIran. 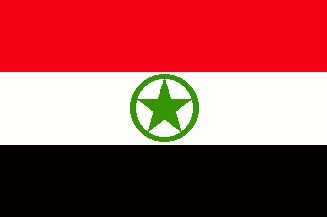 (5) “Ethnic Politics of Khuzestan.” Wikipedia website. 22 January 2006. http://en.wikipedia.org/wiki/Ethnic_conflict_in_Khuzestan. (7) Daniel Brett. “Democracy, Ethnicity, and Repression in Iran: The Plight of the Ahwazi Arabs.” The Henry Jackson Society. http://zope06.v.servelocity.net/hjs/sections/middleeast/document.2005-11-27.8841263680. (8) “Country Analysis Briefs: Iran.” Energy Information Administration. http://www.eia.doe.gov/emeu/cabs/Iran/Background.html. (9) Daniel Brett. “Democracy, Ethnicity, and Repression in Iran: The Plight of the Ahwazi Arabs.” The Henry Jackson Society. http://zope06.v.servelocity.net/hjs/sections/middleeast/document.2005-11-27.8841263680. 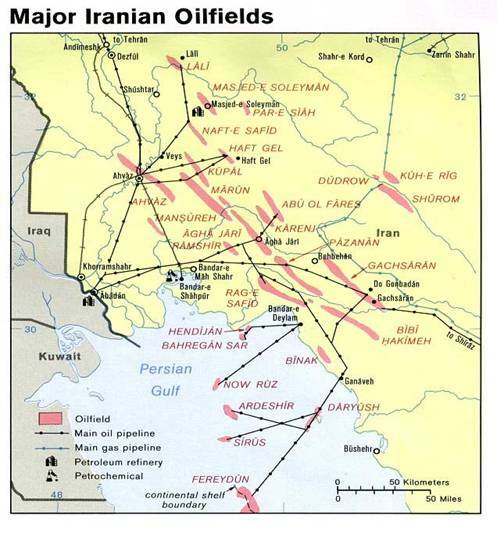 (10) "Major Iranian Oilfields." University of Texas library website. http://www.lib.utexas.edu/maps/middle_east_and_asia/iran_major_oilfields78.jpg. (11) “Iran-Iraq War.” GlobalSecurity.org. http://www.globalsecurity.org/military/world/war/iran-iraq.htm. (12) Avshalom Rubin. The Double-Edged Crisis: OPEC and the Outbreak of the Iran-Iraq War. Middle East Review of International Affairs. Volume 7, Number 4. December 2003. Page 2. (13) “Iran-Iraq War.” GlobalSecurity.org. http://www.globalsecurity.org/military/world/war/iran-iraq.htm. (14) “Ethnic Minorities Singled Out for Attacks in Iran.” Amnesty International. October 2005. http://web.amnesty.org/wire/October2005/Iran. (15) Michael Rubin. “Domestic Threats to Iranian Stability: Khuzestan and Baluchestan.” Jerusalem Center for Public Affairs. Vol. 5, No. 9. 13 November 2005. http://www.jcpa.org/brief/brief005-9.htm. (16) “Iran Rocked by Series of Blasts.” BBC News. 13 June 2005. http://news.bbc.co.uk/2/hi/middle_east/4084908.stm. (17) “Iranian Official Says 3 Groups Claim Responsibility for Bomb Attacks in Ahvaz.” Tehran Iranian Students News Agency. World News Connection. 13 June 2005. (18) “Group Claims Ahvaz Blasts; Stronger Indications Point to UK Role.” Voice of the Islamic Republic of Iran Radio 1. World News Connection. 18 October 2005. (19)“Funeral Procession to be Held 17 October for Victims of Southwest Iran Blasts.” IRNA. World News Connection. 16 October 2005. (20) “Group Claims Ahvaz Blasts; Stronger Indications Point to UK Role.” Voice of the Islamic Republic of Iran Radio 1. World News Connection. 18 October 2005. (21) “Ahvaz Bomb Blast Kills 9 People, Wounds 45; Politicians React.” Mehr News Agency. World News Connection. 24 January 2006. (22) “No Casualties Reported Following Explosion in Southwest Iran.” IRNA. World News Connection. 28 January 2006. (23) Robert G. Hoyland. Seeing Islam as Others Saw It: A Survey and Evaluation of Christian, Jewish, and Zoroastrian Writings on Early Islam. Princeton, New Jersey: Darwin Press, 1997. Page 184. (24) "Khuzestan Province." Wikipedia website. http://en.wikipedia.org/wiki/Khuzestan. (25) “Climate, Khuzestan.” IranCaravan.com. http://www.irancaravan.com/SPR.htm. (26) “Provinces of Iran.” Statoids.com. http://www.statoids.com/uir.html.